It meets the M27 at junction 3. 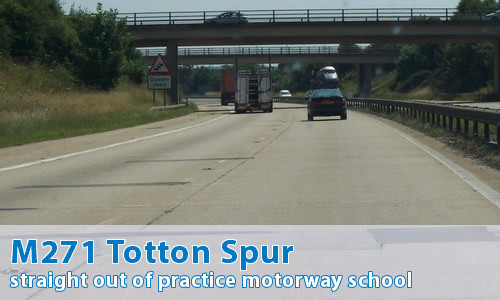 Well, the person who was driving at the time of taking the photos described it as "a practice motorway; sort of like it's just been a project in 'learning how to make motorways' school"! OK, can you give me that in English then? Well, let's start at the northern end. The terminal roundabout is perfectly reasonable. Then we get to the M27 junction and we have to stop for a roundabout! That's right, stop for a roundabout. No flyover, no underpass. And if that wasn't enough, there's some traffic lights on it too! It's so bad that it's one of CBRD's Bad Junctions. Astounding. Mind you, next we have a proper junction, the only one on here, and it is with an unclassified road! It can't even be bothered to meet an A or B road! It's also junction 1, which leads me to suppose that the M27 junction is junction 2, but that number never appears on the signs! Then, we get to the southern terminal junction, where three lanes of traffic seem to head straight for a block of flats, before all getting turned sharp right and having the entire motorway dumped onto a tiny roundabout. There's also an awful surface along most of it; possibly even worse than any other motorway I've been on. Is it actually the worst motorway in the country? You'd certainly have to say it is a good candidate. Can I see some more photographs? I like your inclusion of the M271: You really should have mentioned the slip road joining the M27 Eastbound, which I think deserves an award as 'The sliproad most likely to cause an accident'. The sharp bend at the southern end of the M271 is the sharpest bend anywhere on the UK motorway network, and has itself been responsible for some pretty horrible crashes, including a coach crash which committed every on-duty ambulance from the three nearest ambulance stations. Briefly in its favour (if you can call it that) it might be Britain's most predictable motorway. It is perfectly freeflowing at most times during the day apart from a being bit heavy going into town in the morning rush hour but in the evening it instantaneously gridlocks at 5:02pm when the entire of the Nursling Industrial Est. empties itself onto the motorway going northbound. There isn't even an extra lane which there is southbound (completely unnecessary) and of course all this solid traffic is heading for the beloved roundabout junction with the M27. Its a good job there is so much traffic because we all know how illegal it is to stop (even for a roundabout) for any reason other than traffic on a motorway. The M271 curves sharply at the southern end to dodge some flats. However as the motorway goes through playing fields just before that, surely a route that is more gentle could be done. There are two reasons i can think of for the sharp curve. 1)The curve is there to slow people down before the roundabout, also seen coming south to the M27 roundabout further north, as well as on other motorways (the A627(M) and A6138(M) have examples of this). The latter is the more fun (and a lot more likely - I'm almost certain). However there are none of the usual "meant to go further" features, like carriageway splits or lane drops. This could be because, at the time construction had started it was planned to go further, and so the land for it had been brought. However by the time it was finished, those plans had dried up (due to costs and bad traffic surveys). Instead of building a flyover anyway Redbridge Towers was saved and they ended the motorway on the roundabout, via the route that the slip roads were going to take, only without the room for the future flyover. One thing I noticed is, right behind the block of flats is the A35. The A35 is fully grade separated, and Dual Three Laned Carriageway right until a TOTSO set of traffic lights with filter lanes in the heart of Southampton. So the question is, was the M271 meant to continue on past the flats and into the heart of Southampton? Jessica Carter tells us something I hadn't noticed! In reference to the stated motorway, not only is it truly pathetic, the sign-makers don't even know what road it is! Heading towards Bournemouth on the M27, the sign at the roundabout reads, 'Romsey M271' for the northbound section. However, heading away from Bournemouth on the M27, the sign for the northbound section reads, 'Romsey A3057'. The roundabout is currently being widened [December 2005]. I've seen a new lane on the northbound side, and as there are lane closures all the way round, I'm guessing southbound will be done too. I happened to drive down the M271 recently. Thought it was a little under-spec on the way into Southampton, but nothing more. Then on the way back (I live north of Bristol) I suddenly realised that I was on a roundabout... on a motorway! Now while I'm well used to driving on a roundabout subject to motorway regulations (M4/M32 junction, the A21 spur off the M25 at Sevenoaks for example) this just struck me as insane. My immediate thought... "I wonder if that's on Pathetic Motorways, if it isn't then it damn well should be! " Of course, it is on here, and quite rightly so. Have never seen anything so insanely stupid as having a roundabout in the MIDDLE of a motorway! There's some great birds eye photos of the M271 here. The thing that really brasses me off about this road is that roundabout. I quite often stay in Farnborough with relatives and have a friend in Romsey that I visit often and use this motorway to get in to Romsey, despite the pitiful excuse for a road surface on the northern part. My last journey was going to plan (M3, M27) until I came off the M27 here. What idiot puts traffic lights on this roundabout and then fails to consider the slip road from the direction of the M3 taking the docks traffic? The traffic just kept coming and coming without a break - some lights would have let me move at least! Somewhat strangely, my stereo was playing Oasis' "Going Nowhere" song at the time... hmm. When I did get going I hit every red light when there was no traffic wanting to join the roundabout. Memo to any Highways Agency people who may read this - if you are going to put traffic control measures up, finish the job or don't bother starting it at all! I use this piece of Motorway most weekdays and can honestly say it aint much fun. Ok, they have resurfaced the Southbound part between J1 (Nursling) and the Millbrook terminus (Millbrook Towers). They have also changed the Southern Terminus entrance to 2 lanes only. This was prompted after 3 truck 'roll-overs' in the same week. The bend is still as tight as ever and it is pretty easy to understeer into the central reservation (seen that one done more than once), you just have a much wider lane in which to do it in. The M27-M271 slip is also scene of many an accident. I have seen more than 1 car (usually GTis or Sports Cars) either buried in the armco or half in the ditch that runs along the edge of the road. There is a massive bump as the road changes from proper tarmac to the prefab concrete and I suspect this catches out people turning through it a bit quick, unsettles the car and offers it an invitation for a close-up of the scenery. Other than that, I can confirm all the other statements made about this road, especially the 17:02 jam as everybody goes home. My dad used to this on the way back from uni in my first year, on the way to the West country. I remember both of us thinking what a rubbish surface it was. My dad didn't dare pass 60, and the traffic seemed to be mostly lorries. I didn't realise there was a roundabout in the middle until I found it on here. The thing is they're hoping not many people will want to use the length of it, so not notice. As hard as it is to believe, a couple of months back there was a leaked council document in the local press about a proposed extension to the M271, with proposals to extend the motorway to the Millbrook Roundabout on the A35/A33. It was a long article which basically had all the future transport plans for the greater Southampton region in it. There were a couple of speculative options for how the extension could take shape, including a possible tunnel and/or demolishing the tower block. Unfortunately the article seems to have vanished off the Daily Echo website! (I certainly can't find it!) But if anyone else sees any more news on this document it might be worth watching. Even if it does seem unlikely to ever happen, especially under the current government, it at least stated the city council acknowledges the junction with the A35 is a problem. The schemes mentioned tie in with the not-so-secret local transport plan from Hampshire council, which lists a £60m 'M271 spurs' project in the 2011-2026 timeframe but doesn't give any further details. Having spent an hour getting out of Southampton last week because the A35 was looking like a car park near to Redbridge it'd be nice to see this extension put in place, but it looks like we'll be lucky if we're be able to drive our hover-cars along it in our retirement years!